Saturday, November 3. Choose one or both workshops below. Yoga teachers, are you looking for continuing education credits? 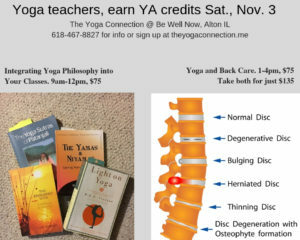 Jami Marsoun, RYT 500, will be at The Yoga Connection at Be Well Now in Alton Saturday, Nov. 3 for two 3-hour workshops. Take one or both. Three Yoga Alliance contact hours will be awarded for the successful completion of each workshop. Lunch is on your own; there are many options in the immediate area and a kitchen with microwave and frig is available on-site. Pre-registration required. Integrating Yoga Philosophy into Your Classes. Some yoga teachers are uncomfortable with the idea of introducing yoga philosophy in their general classes. We don’t want to offend others’ belief systems or unintentionally dissuade students from practicing yoga by introducing Eastern religions. In this workshop, we’ll learn ways to bring the richness of yoga philosophy, such as the Yamas and Niyamas, spiritual development and yoga sutras, into our classes so that our students can reap the deeper benefits of yoga practice. (Bring a copy of your favorite yoga text for inspiration.) Saturday, Nov. 3, 9am – 12pm, $75. Yoga and Back Care. Do you know how to respond when a student tells you they have sciatica, or spinal stenosis? Many students come to yoga looking for a safe way to exercise with back problems and hoping to relieve some of their pain. In this workshop, we’ll take a closer look at 5 common spinal conditions and learn how to work with them in class in asanas, through careful sequencing and the use of props. Class will include ways of keeping students with back pain safe within the legal scope of our practice as yoga instructors. Saturday, Nov. 3, 1-4pm, $75.